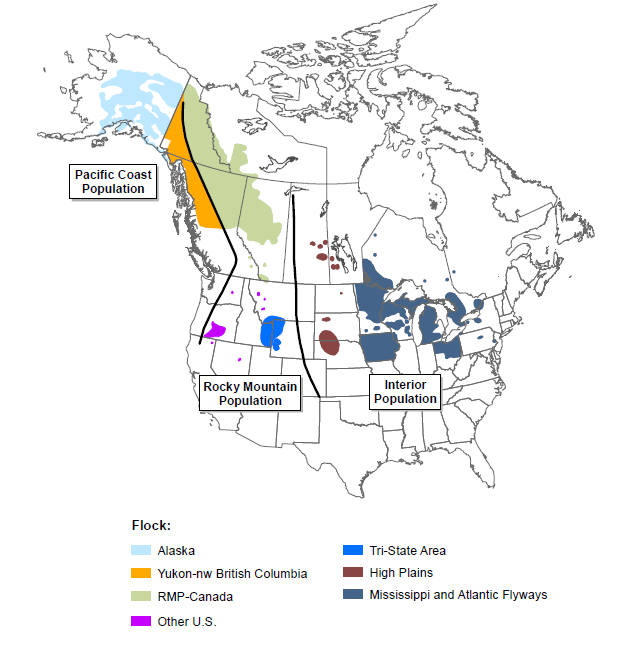 The historic breeding and wintering range of Trumpeter Swans once covered much of North America. By the early 1900s however, the species had been extirpated from virtually most of its range by market and subsistence hunting. Ornithologists had little hope for its recovery. By 1932, a survey by the National Park Service found there were less than 100 Trumpeter Swans in the area including Yellowstone National Park in Wyoming, the Red Rock Lakes in the Centennial Valley of Montana, and others in the surrounding region. At the time, these were thought to be the only birds remaining for the entire species. In 1935, Red Rock Lakes National Refuge was established to protect this small population. 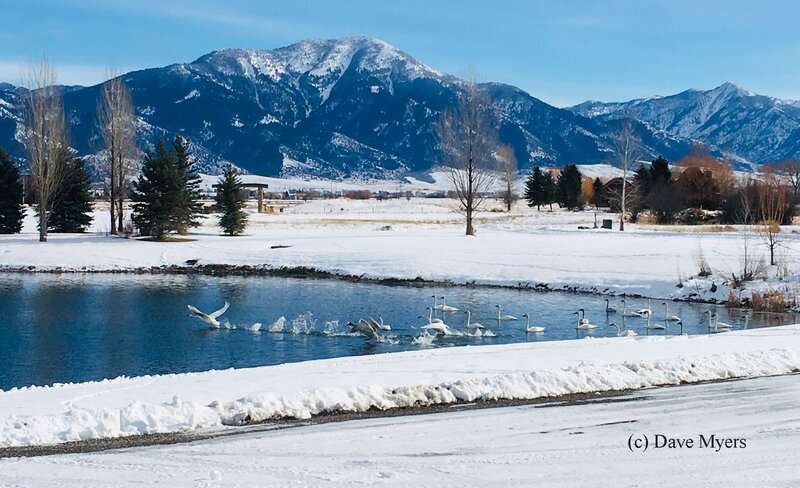 Red Rock Lakes National Wildlife Refuge (RRLNWR) was the source for swans and eggs for early restoration efforts at western Refuges in the 1930s and 1940s. Beginning in 1959, swans from RRLNWR were provided to zoos and private propagators, translocated to other National Wildlife Refuges, and used in early Midwest efforts to restore the Interior Population. 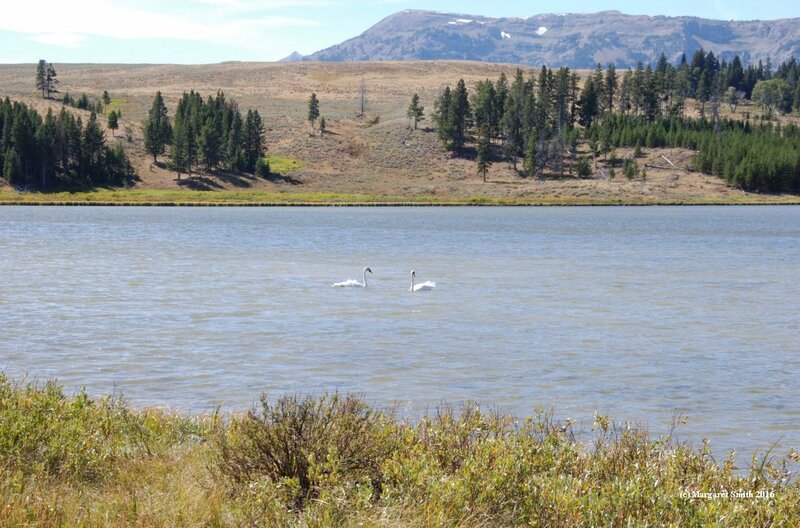 The Refuge continues as important swan habitat for the Greater Yellowstone Area population. 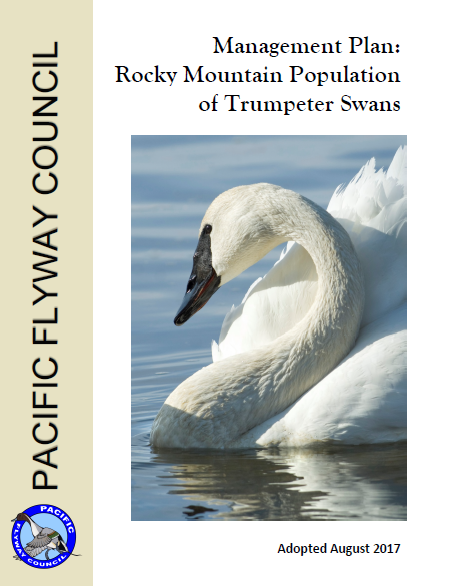 You can download Winston Banko's classic 1960 monograph about Trumpeter Swans. He was past manager at Red Rock Lakes National Wildlife Refuge. His book was a compendium of just about everything known about Trumpeters at the time. It is still extremely accurate. His monograph is still used by swan managers today! Today, less than 20 percent of all continental Trumpeter Swans nest, breed, or winter in the Rocky Mountain Population (RMP). 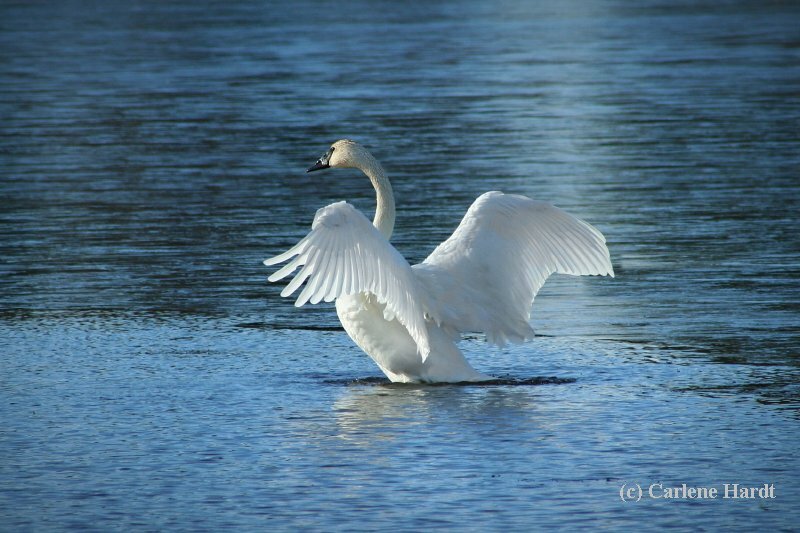 In 2015, there were a reported 11,700 Trumpeter Swans in the RMP. The majority (95%) of the Rocky Mountain Population nests in Northern Alberta, British Columbia and the Yukon Territory. For the most part this group migrates to the tri-state region of Montana, Idaho and Wyoming for the winter, joining a small population (nearly 550 white birds) of non-migratory Trumpeters that nest in the region. In 2015, there were an additional 216 white swans in the "Other Flocks" of the United States RMP. 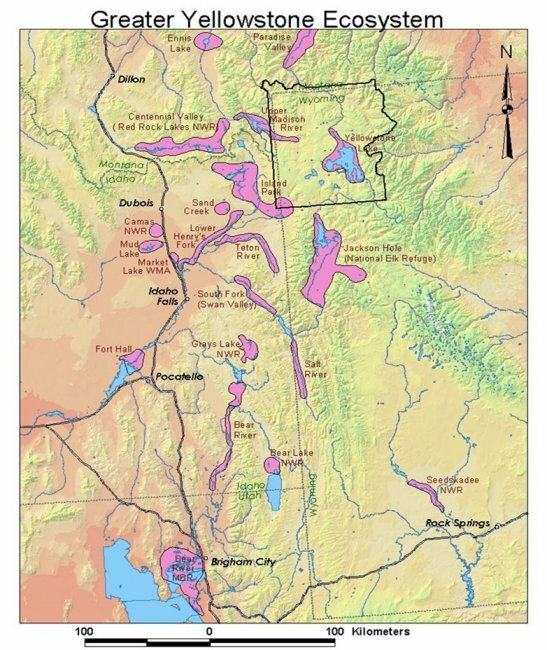 The RMP is generally divided into three main flocks: Canadian, Tri-State/Greater Yellowstone area, and "Other Flocks." The United States's RMP of less than 800 white swans is of particular concern. United States RMP flocks include swans that nest in the Greater Yellowstone region of Montana, Wyoming, and Idaho. In winter, they are joined by several thousand swans from the Canadian flock, putting pressure on the limited areas with open water and available food. The "Other Flocks" in the US RMP are restoration flocks in Oregon (Summer Lake Wildlife Area of Oregon and Malheur National Wildlife Refuge), Nevada (Ruby Lakes National Wildlife Refuge), eastern Washington (Turnbull National Wildlife Refuge) and Montana (the Flathead Valley and the Blackfoot Valley). The three flocks of the Rocky Mountain Population are Canadian (green), Tri-State/ Greater Yellowstone area (blue) and "Other" restoration flocks (purple). Most of the swans released in the Oregon Restoration Project are cygnets. This is the first successful nesting pair of Trumpeter Swan released as cygnets themselves in Oregon several years before. We are a partner in the Oregon Restoration Project. 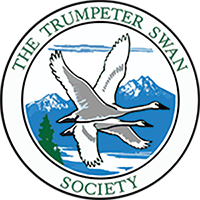 We partner with the Oregon Department of Fish and Wildlife and the United States Fish and Wildlife Service to bring Trumpeter Swans back to Oregon where they had been missing for decades. In 2009, we began releasing Trumpeter Swans at Summer Lake Wildlife Area with a goal of restoring a healthy, viable, and sustainable breeding population of Trumpeter Swans to eastern Oregon. By the end of 2017, the Project has released a total of 112 Trumpeters at Summer Lake Wildlife Area. Trumpeter Swans in the project receive green neck collars for tracking. Your donation to the Oregon Restoration Project helps bring Trumpeter Swans back to Oregon. The Trumpeter Swans that nest in the Greater Yellowstone region of Idaho, Montana, and Wyoming in and surrounding Yellowstone National Park were the only group that survived in the U.S. south of Canada by 1930 as Trumpeters neared extinction. These Greater Yellowstone swans are one of the best-known icons of North American wildlife conservation and treasured by thousands who read E. B. White's "Trumpet of the Swan" in their school days. During the past few decades their nesting effort and adult numbers have risen very slowly and these swans face significant threats including isolation, winter habitat scarcity, and changing hydrology reducing wetland suitability. TTSS continues its decades-long work with regional partners to address these serious issues. In 1932 Yellowstone National Park was one of three areas the National Park Service documented as having Trumpeter Swans. The Park has seen a decline in the number of swans in the past few decades and is working to restore Trumpeter Swans.